A smart SEO strategy will lead people to your site. A good writer will keep them there. These days, every client has a need for digital content. Persuading users to do the almighty "click" on your content requires well chosen keywords (not SEO "stuffing") and writing what people care about. National Grid is one of the largest energy providers in the Northeast. I wrote copy for their new content management system, a complex project involving multiple versioning for different audiences and geographical areas. I worked remotely from Rochester and on site at their Brooklyn headquarters. You can look at the site here. 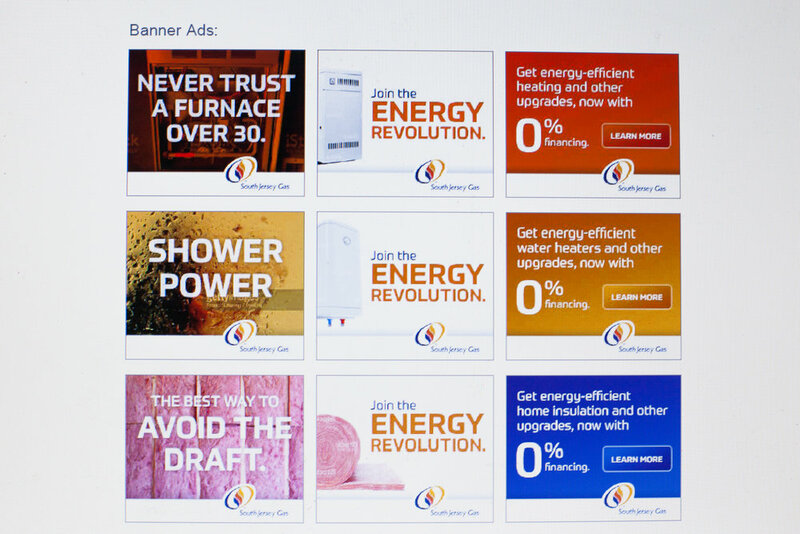 For South Jersey Gas, these Facebook carousel ads promoted energy efficiency to millennials. Playing off their fondness for 60's retro culture, it used protest slogans to "Join the Energy Revolution". This was also a successful direct mail postcard campaign. Content isn't always written. I've done a number of online videos for posting on YouTube, social media, and websites. I wrote the script for this video for Juniata College, but we used an actual student to do the read and make it "real". I have written web articles to promote the University of Rochester Medical Center, Cornell University, Columbus Academy, and others. See Digital Newsletters/Features. Websites change constantly, so I don't post links here in case my copy is no longer up. Suffice it to say I've written or contributed to many websites, including this one!